The Cell Counting Kit-8 is a colorimetric assay kit used to measure cell proliferation and cytotoxicity. It is a ready-to-use solution that does not require radioisotopes and correlates with the [3H]-thymidine incorporation assay. It can be added directly to the cell media for fast, high-throughput screening without a solubilization process obtaining highly reproducible and accurate results. 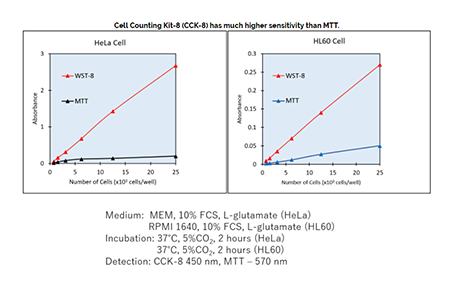 CCK-8 has shown to achieve higher sensitivity and stability than MTT, MTS or WST-1. CTLL-2 cells were incubated with various concentrations of IL-2 for 72 hours. CCK-8 solution was added to each well and the absorbance at 450nm was measured. IL-2 exposure resulted in an increase absorbance which correlates to an increase in cell proliferation. CTLL-2 cells were incubated with various concentrations of IL-2 for 72 hours. CCK-8 solution was added to each well and the absorbance at 450nm was measured. IL-2 exposure resulted in an increase absorbance which correlates to an increase in cell proliferation. CCK-8 shows greatest sensitivity. Principle: Employs the tetrazolium salt WST-8 (2-(2-methoxy-4-nitrophenyl)-3-(4-nitrophenyl)-5-(2,4-disulfophenyl)-2H-tetrazolium . monosodium salt), that produces a highly water soluble formazan dye upon biochemical reduction in the presence of an electron carrier, 1-methoxy-PMS. The amount of the yellow colored formazan dye generated by dehydrogenases in cells is directly proportional to the number of viable cells in a culture medium.